2017 was a year of lower inventory. Lower inventory meant fewer homes being sold, homes selling faster, and selling prices increased compared to 2016. 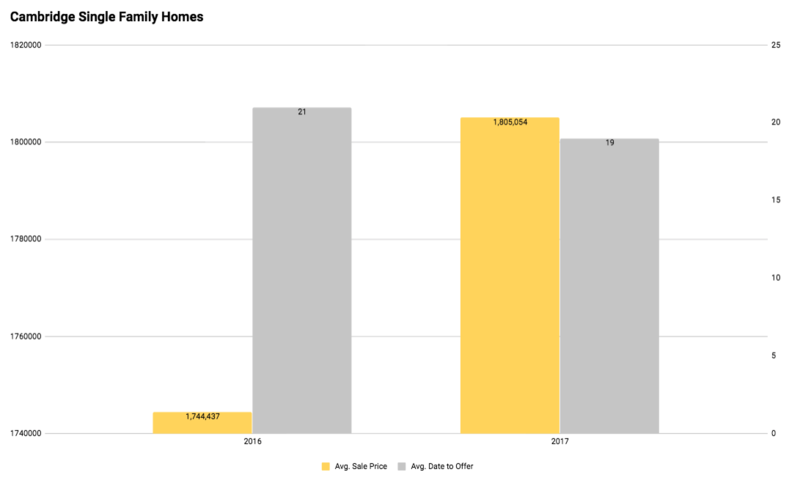 Below you will find some insights on how the Arlington and Cambridge housing market faired last year in comparison to 2017. Arlington, Massachusetts is a thriving, historic community northwest of Boston. Arlington is home to established neighborhoods, excellent schools, and plenty of amenities. There were 277 single family homes, 234 condos, and 37 multi-family homes sold in Arlington, Massachusetts last year. When looking at 2017, there was a 3% decrease in the number of single family homes sold compared to 2016. Condo sales dropped 14% compared to 2016 and multi-family home sales dropped 12% compared to 2016. Because of the lower inventory we saw in 2017, there was a drop in the number of days homes sat on the market before an offer came in. Single family homes in Arlington were only on the market an average of 16 days before an offer, 1 day less than 2016. Condos in Arlington were on the market for 12 days before an offer in 2017, 2 days less than 2016. 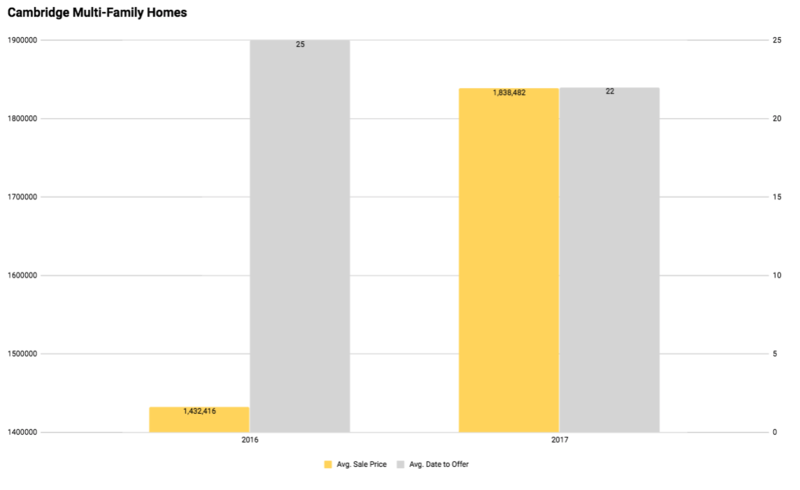 Multi-family homes received offers faster than both single family homes and condos in Arlington last year, on average receiving an offer within 11 days, 4 days less than 2016. 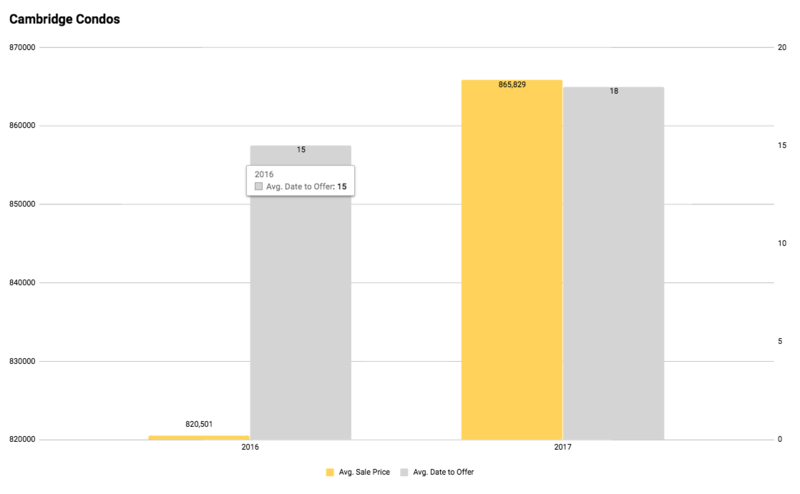 The average selling price of a single family home in Arlington was $750,000 in 2017, a 6% increase compared to 2016. The average selling price of a condo in Arlington was $570,000 last year, a 12% increase compared to 2016. 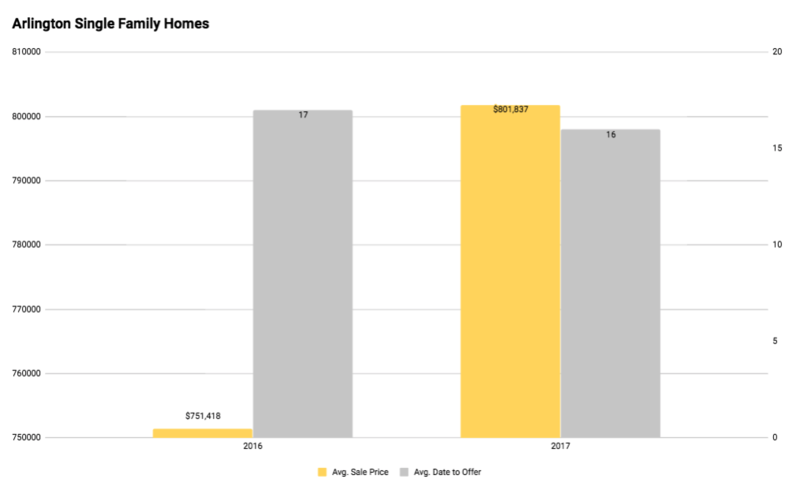 The average selling price of a multi-family home in Arlington was $891,000 in 2017, a 4% increase compared to the previous year. Cambridge, Massachusetts is located directly north of Boston across the Charles River. Cambridge is made up of distinct squares that give the city its charm. Regardless of what you're looking for, Cambridge has something for everyone from newly constructed condo buildings to established neighborhoods that are perfect for raising a family. In 2017, there were 89 single family homes, 606 condos, and 77 multi-family homes sold in Cambridge. Compared to 2016, there was a 8% decrease in the number of single family homes sold in Cambridge. In 2017, condo sales dropped 10% in Cambridge and multi-family home sales dropped 15% compared to 2016. 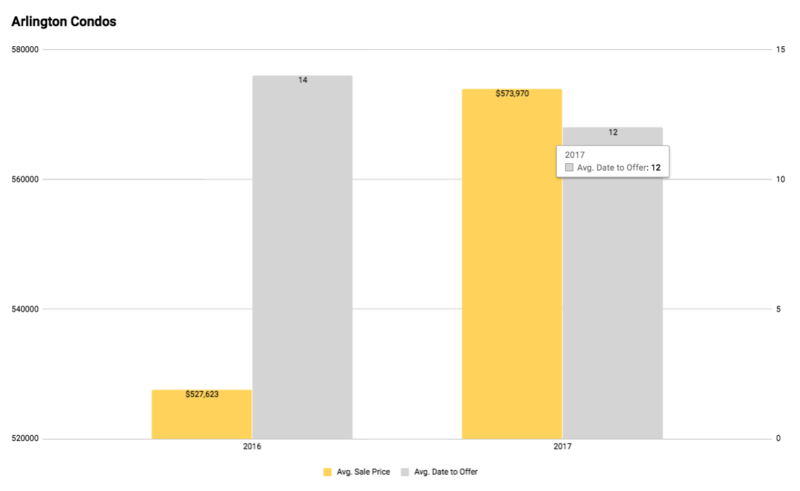 Single family homes in Cambridge were only on the market for 19 days before an offer came in, 2 days faster than in 2016. 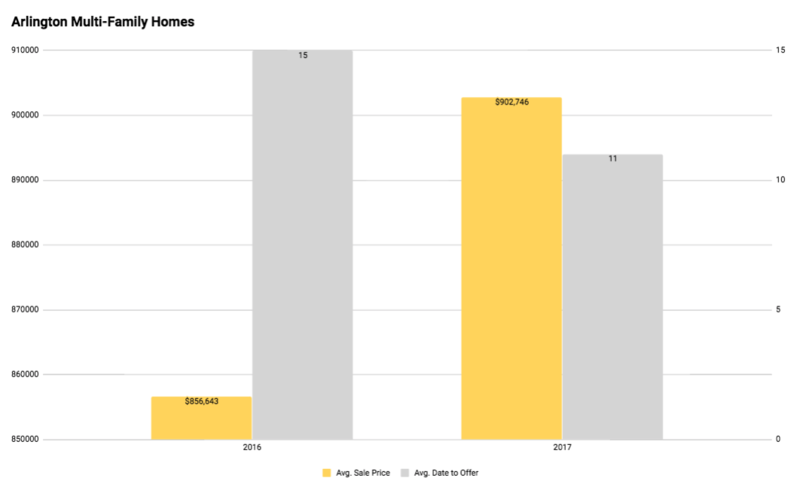 Condos in Cambridge sat on the market for 18 days before an offer, 3 days longer than they did in 2016. Multi-family homes were on the market for 22 days before an offer came in, 3 days quicker than 2016. Single family homes in Cambridge sold for an average of $1,805,054 in 2017, a 4% increase from the previous year. Condos sold for an average of $864,829, a 5% increase from 2016. Multi-family homes sold for an average of 1,838,482 in 2017, 28% increase from 2016.